HOW DID THE NAME CRAZY MONKEY COME ABOUT? The story behind the name started as a joke but has since then become synonymous with a modern martial arts program that creates champions not only on the mat, but in life as well. As far back as 1998 we were already playing around with martial art ideas and concepts that we know today as the Crazy Monkey Defense Program (CMD). In those early days we did not have a name for what we were doing. A chance encounter by one of Rodney King’s friends on a Safari changed all of that. While Rodney’s friend was on holiday enjoying the African bush during a game drive, he came across a troop of monkeys sitting under a Baobab tree. While watching the monkeys play and groom each other, they suddenly became restless and very agitated. In the far distance Rodney’s friend could see another troop of monkeys coming their way. The invasion of territory that followed by this new group of monkeys caused a massive fight between the two groups. While watching this unfold Rodney’s friend noticed how some of the monkeys would lift their arms and cover their heads with the palms of their hands face down in defense of the incoming assault (a similarity shared with the Crazy Monkey defensive hand position). On returning from his Safari, Rodney’s friend could not wait to tell everyone about, “these Crazy Monkey’s he had seen” and naturally he went on to tell everyone his Safari story. While everyone was standing around in the gym listening, some of the guys suggested, “Why don’t we call it that, the Crazy Monkey?” Needless to say the name stuck. I HAVE NO MARTIAL ART EXPERIENCE? As long as you have a healthy attitude towards your training and towards others you'll get along just fine. Initially you'll have an introductory lesson with a trainer so your training can hit the ground running so to speak. Also, the more experienced clients will want to help your development as well. This is because they want your game, abilities and fitness levels to improve so you can then push their games with your new abilities. CAN I JUST PITCH UP OR COME IN AND TRAIN? We have found that meeting with potential clients first, and getting to know then, their goals and aspirations, allows us to best serve them, and propose the best possible training options. In Johnsonville, Wellington, BUT, please call us before coming in. We would love to meet you, sit down and chat about your training reasons and goals. 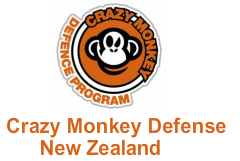 Crazy Monkey Defense New Zealand was established in New Zealand in 2010, with the the Global Crazy Monkey Defense group originating in the 1990’s. 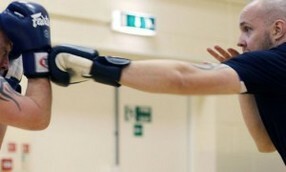 Our mission is to prepare my clients for Full Contact Living! To help you achieve this, we designed Crazy Monkey Defense around a unique training philosophy, with 5 specific goals. We designed Crazy Monkey Defense to work under fire, but still be accessible to anyone, regardless of their physical fitness. Our proven 2-hour a week peak performance model has worked for thousands of clients around the world. The success we have had with coaching special force military operators, law enforcement officers and other professionals on the front line of defending against violence - proves that what we coach works! Many martial arts talk about the 'mental game' yet have no idea how to develop it. In Crazy Monkey we offer a step-by-step approach to coaching the mental game. This part of our program developed by Rodney King M.A. and world renowned mindbody philosopher Dr. Christian de Quincey, bring together the best of martial art performance, with cutting edge insights into the fields of somatics, performance philosophy and psychology. We designed Crazy Monkey Defense to honor the life performance philosophy that has always been a part of martial art history. At Crazy Monkey we honor the past, while moving with the present. Traditional values in martial arts still matter to us and our clients. Crazy Monkey is a socially conscious modern martial art program. We care how what we coach is used, not only on the mat, but in the world! Crazy Monkey Defense is free from the meatheads, ego and hyper-competitiveness so prevalent in the world of modern martial arts today. Training at Crazy Monkey is fun, safe, family oriented, while still personally challenging. Finally and most importantly, Crazy Monkey Defense is a modern martial art program that not only changes lives on the mat, but allows for those lessons learned to help clients perform at their best in life. These 4 goals have become the hallmark and the backbone of the Crazy Monkey experience, an experience that thousands of our clients from all over the world love.